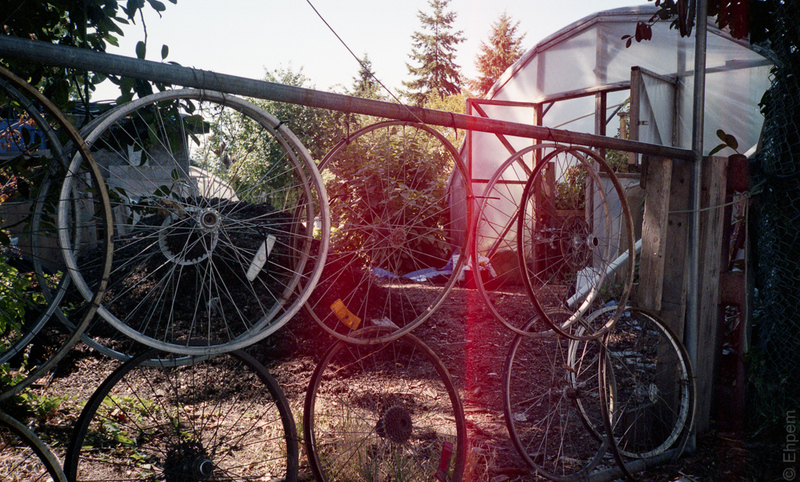 Light leaks are one of the things most often met when testing old film cameras. Some of these light leaks are so serious that there is nothing much that can be done – see for instance these results from testing my grandmother’s Kodak Vest Pocket camera. While those leaks can’t be easily fixed in post (and repairing the bellows on that camera is no simple matter either) their character is so much in keeping with photos from the early 1900s that I find they add to the images rather than detracting. Since film purchase and processing of negatives (no prints or digitising) runs to at least $10/roll or 40 cents a shot, I feel compelled to figure out how to deal with the light leaks, or at least recover something from the better test shots. Most of my camera tests have been with colour negative film which is cheaper and faster to buy and process. Also I have discovered colour to be much more amenable to recovering images with light leaks. There are more recovery options than with black and white – either by using global or masking colour adjustments or with black and white conversion and colour filters. I use Lightroom for most of my edits on scanned film, and digital images and all of these transformations have been made with Lightroom. Quite a few of the photos in my Olympus XA2 series had minor light leaks that I have removed. Below the following image is a brief digest of my treatments with captioned examples in the photo gallery. The most radical fix is to convert to black and white and adjust the colour filters to compensate for any banding that may occur. The success of this approach very much depends on the original image and what colours are present and whether there are large planes of a single colour crossed by a light leak. The wheel gate above works very well in black and white and as far as I am concerned this image is totally useable with this approach. In the gallery below, the door with red splashes of paint just does not work in black and white, and in any case the background shows banding from the light leak, or is it a shadow of power lines? Since the streak of light is stuck in my mind, I can’t accept the bands, even if they are natural. This is a shot I plan to retake sometime, unless someone paints the door. On the other hand the shadow of the light-standard on the street surface took almost no effort to fix – the b&w conversion preset for a Blue Hi-Contrast filter took care of the problem with no need for other adjustments. Electric Mayhem was more complicated. That image is more interesting in colour than black and white, but there is a lot of red in the bus and so a global desaturation of the reds took away too much from the picture. Therefore I masked the light leak with a very soft-edged and partly transparent mask, desaturated the mask, applied some white balance shifts to it to help it blend in and then edited the whole image to help it blend a bit more. If you did not know about the light leak I don’t think you would spot it in the colour version. Certainly it is gone in the b&w conversion. The Pizza Zone shot was a poor exposure to begin with as you can see from the colours – this image was not going to work in colour for that reason alone, and the light leak just nailed that coffin shut for me. On conversion to black and white, a careful use of the colour filters pretty much deals with the light leak. Traces remain that could be got rid of with some cloning but I am not sure either of the two versions I produced emphasizes what I liked about these buildings in the way I hoped for. I could have worked at it some more, probably with more success, but the loss of the red car and red sign dissuaded me from putting more effort into it. The fire hydrant shot is in some ways the trickiest because I prefer the colour. I like that there is not much colour except for the hydrant which unfortunately is nearly the same colour as the light leak. I tried a b&w conversion with colour added back for the hydrant via a mask but after just a bit of work I could see it was not going to turn out how I wanted. In the end I applied a mask to the light leak, desaturated it, reduced its clarity, changed the white balance and so on. That almost worked but I found when I edited the whole image and added just a bit of yellow to the white balance that it ended up closer to where I want to be. However, the leak is still visible and I did not feel like spending more time on it – I think I might be able to get it sorted out if I work a bit harder at it, but the image is probably not worth the effort. Perhaps I will come to like it with a full B&W conversion. So, those are some of the things I have been trying in LR5. I am looking for quick and easy fixes, not long involved ones that include moving of bits of the image around and so on. Not for these kinds of photos anyway. Obviously, the best bet is to replace the light seals in the camera but in the case of the XA2 it had new seals, and after the first roll (which is the worst of these light leaks), they were redone again and still leaked (the lesser light leaks in this post). Right now I am running a roll of Fuji colour print film through it (it is usually in my trouser pocket) with varying degrees of electrical tape over the seams to see where the leak is and then the seals in that area can be beefed up, or replaced, or something. The Yashica Electro 35GS had no seals left, just a sticky residue, so I replaced them and am hoping there will be no light leaks once the first roll of film comes out of the camera – it goes out with me in the car but the light has been terrible of late so only a few shots have been made. It has a roll of older Kodak colour print film my mother gave me in it, one that expired about 10 years ago. It should be good enough to test for light leaks, and in fact I expect it will be just fine. The Olympus XA has rotting seals, but no light leaks so I have not messed with it yet, it has a roll of black and white film in it at the moment, and lives in my coat pocket. The Olympus 35RC has newish seals and does not leak – but the light meter doesn’t work, nor does the frame counter and I think there may be some fine abrasion on the lens coating but it is very hard to see in most light – so it may be a dud. It appears to have been a bit abused when serviced last – various scratch and torque marks on different screw heads. Since I can’t make it much worse, I am going to try to fix it once I have a tool to open it up with. My Olympus Pen half-frame had lousy seals with some leaking and I replaced them, but that was a jury rigged affair and I need to redo them as there are minor intermittent leaks still. It too has some black and white film in it, and all the seams are taped, but it is in a camera bag and not out and about at all lately. If I had some money, I would take several of these cameras in for a professional going over – instead I am learning how to do things myself which is not a bad thing. To open the gallery below click on any image then navigate with the arrows (or swipe) and escape (or X) to return to this page. Preset conversion to black and white using Blue Hi-Contrast filter. Same as previous but whole image white balance warmed up a bit. B&W conversion, with colour reapplied to hydrant. David, I think you are a bit crazy. Crazy enough, for instance, to like the idea of the newish LomoChrome Purple film. Actually, I think it might go well with red light leaks, whatever colour they turn on that film. A store in town has some in stock. I am not sure I can resist having a roll or two in the fridge, just in case I get in a purple mood. I think you are managing to save a good deal of the images with the techniques your using. I have gotten in the habit of making some color corrections using the adjustment brush in Lightroom. I wonder how many know how versatile this tool is. I use the adjustment brush a lot too – it is very versatile and one of the best tools available in my opinion – especially if shooting RAW with several f-stops of adjustment possible. I just corrected some wedding shots where I needed (but did not have) a flash for infill against a sea and mountains background. I figured I would give them a try with the brush, bringing up the levels on the happy couple, and it worked out remarkably well. Not ideal, but a great compromise that time. I have tape all over one of the cameras, but have been removing a strip of tape after every few shots in the hopes of finding the location of the leak. Then new/additional seals (again) at that location should do the trick. Your suggestion to treat the leaking camera as the black and white of a pair is a good one that I should have thought of. It is the reverse for what I am doing – the leaky XA2 has colour film, the not-leaking XA has b&w and both travel with me. If this current roll does not solve the XA2 leaks, then I will switch that around. As to using the light leaks, what I don’t know (yet) is at what stage the light is getting in – is it as the film comes out of the cannister, is positioned over the shutter or when it is winding onto the take-up spool? I suspect the latter and that I have to be out in bright sun with the camera in the light for a while to get really bright leaks. So many variables!